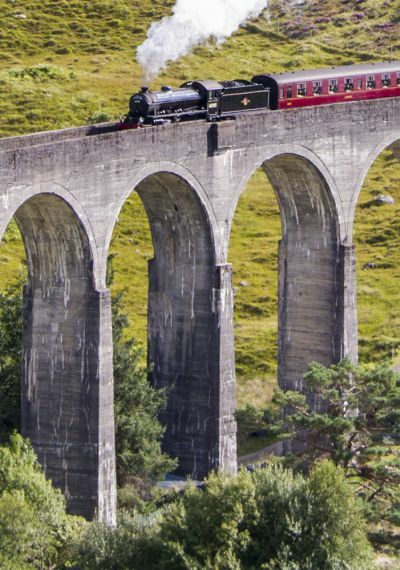 The West Highland Railway has been called ‘the greatest railway journey in the world’ and it’s certainly a trip of superlatives: it starts near Britain’s highest mountain and it passes the country’s most westerly mainland railway station, its shortest river and its deepest freshwater and seawater lochs. There are many fantastic facts, stories and legends about Loch Ness: it holds more fresh water than all the lakes in England and Wales combined; its waters never freeze over; and it’s the home of the Loch Ness Monster. In North Wales’ beautiful Snowdonia National Park you can mountain-bike past abandoned gold mines, soar at over 100mph for a mile along the longest zip line in Europe, or take the adventures underground and go trampolining in old slate mines. Get a 007-worthy view of London’s key sights and the countryside spreading out all around as you soar through the skies in a helicopter. Scotland is packed with scenic driving routes, and the National Tourist Routes are a great place to start. Try the Highland Route, which winds for 118 miles (189km) through the heart of the Highlands between Aberdeen, the Granite City on the east coast, and Inverness, capital of the Highlands. Fly up, up and away in a hot air balloon as you take part in one of Bristol’s most famous sporting activities.